As part of Montreal’s 375th anniversary celebrations, a special ceremony highlighting women who had contributed to the city’s development was held on March 17. Some 20 candidates were honoured during the ceremony, one for each borough of Montreal. The city of Montreal paid tribute to Mother Marie Anne (Esther Blondin), foundress of the Congregation of Sisters of Saint Anne, for her life’s work spent in loving service to children, young people and the underprivileged, and in providing a quality education to both sexes. Mother Marie Anne was an inspiration for generations of women, encouraging them to excel in a society that at that time mainly overlooked their accomplishments. 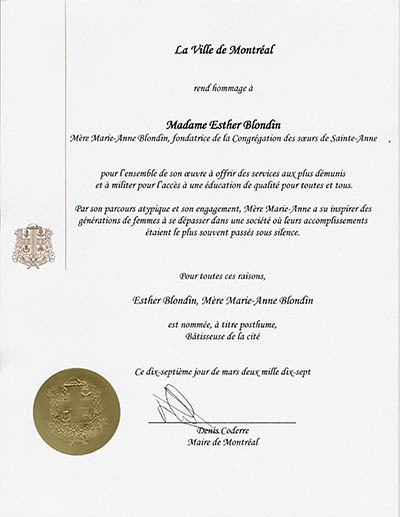 Certain key events contributed to the posthumous selection of Mother Marie Anne as a Bâtisseuse de la cité (Builder of the City). The ceremony was the culmination of an exhibition called Place aux femmes!, which provided an historical overview of some outstanding Montreal women. 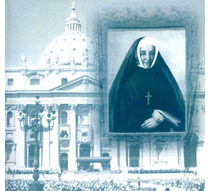 The names of Esther Blondin and the Sisters of Saint Anne were mentioned in a large panel devoted to religious communities, set up in the Hall of Honour of Montreal City Hall. Click on this link to view the certificate issued. Click on this link to read the article « Esther Blondin honorée », which appeared in the Thursday, March 23 edition of the local newspaper Le Messager Lachine & Dorval. In October 2016, Hurricane Matthew struck the southern coast of Haiti with devastating force, leaving a trail of destruction: homes, schools, small businesses and farms. In this context, priority had to be given to repairing heavily-damaged buildings in order to support and continue the Congregation’s teaching activities. The side photos will give you an idea of the damage caused by the hurricane, and the work under way. For those of our families, friends and benefactors who would like to make a financial contribution to the works of the Sisters of Saint Anne in Haiti to improve the lives of Haitians, click here to make your donation. The latest issue of the Message of Marie Anne Blondin is now available on line. To view it, simply click here. Please do not hesitate to communicate with us regarding your comments, favors received, or requests for prayers. 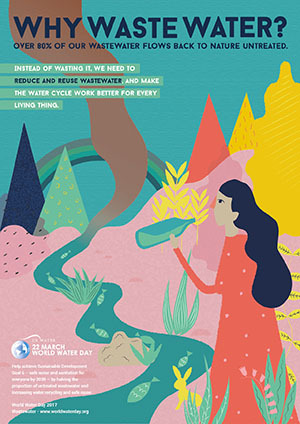 "International World Water Day is held annually on 22 March as a means of focusing attention on the importance of freshwater and advocating for the sustainable management of freshwater resources. World Water Day is an international observance and an opportunity to learn more about water related issues, be inspired to tell others and take action to make a difference." 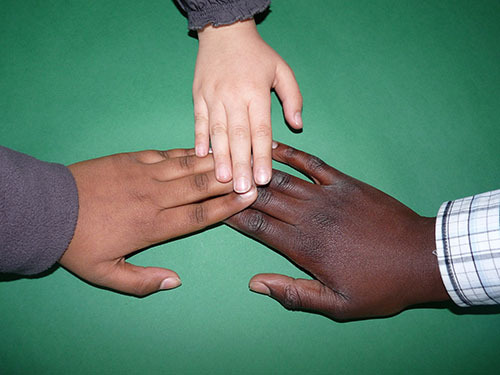 The World Day of Social Justice highlights the imperative of building a future of dignity for all. Social justice must be at the heart of our efforts. 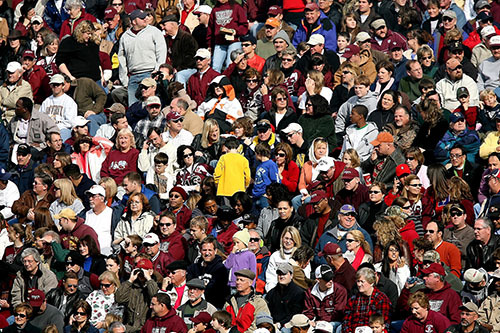 With exclusion and inequality on the rise, we must step up efforts to ensure that all people, without discrimination, are able to access opportunities to improve their lives and those of others. We must build inclusive societies, promote decent work, bolster social protection floors, and bring people in from the margins. 24 January 2017 – United Nations Secretary-General António Guterres today highlighted the importance of recognizing the links between sustainable development and sustaining peace amid such intertwined global challenges as rising inequality, protracted conflicts and climate change. 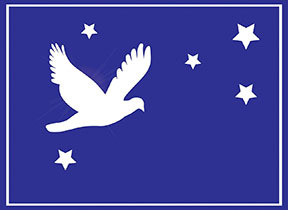 Our priority is prevention – prevention of conflict, of the worst effects of natural disasters, and of other manmade threats to the cohesion and wellbeing of societies,” Mr. Guterres stressed, noting that the best means of prevention, and of sustaining peace, is inclusive and sustainable development. 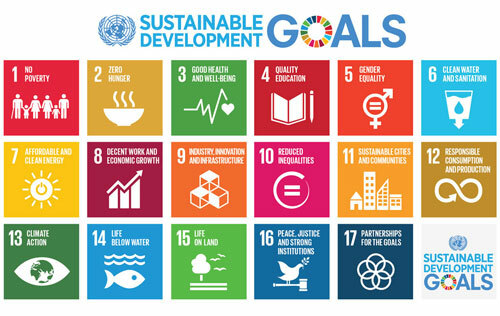 On September 25, 2015, the United Nations adopted a new development program consisting of 17 goals. All countries, institutions and peoples will be working toward these goals for the 2030 horizon. From 2012 to 2015, we took part in United Nations discussions and surveys and sent feedback to contribute to defining the kind of world we want and the new agenda for development with a set of 17 Sustainable Development Goals for 2015-2030. The SSA Social Justice Network has integrated this sustainable development program into its 2015-2016 direction. On april 29, 2017, we will celebrate the 16th anniversary of Mother Marie Anne’s beatification. Activities will be organized in all the provinces to commemorate this important event. If you are aware of something you would describe as a miracle, please inform the Office for the Cause, which will tell you the required documents to support your account. Thank you for sharing any healing or favour obtained through the intercession of Blessed Marie Anne Blondin. 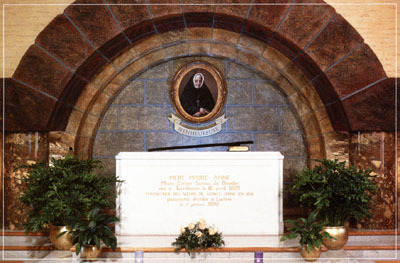 Visits to the tomb of Blessed Marie Anne Blondin take place in an atmosphere of quiet reflection for individuals and small groups. For larger groups of visitors, we can organize a visit to the tomb and the chapel as well as a talk on our foundress. Depending on your interests and our availability, we will make every effort to meet your expectations. Appointments can be made by calling SisterChristine Mailloux at 514-637-3783, ext. 297. The Congregation of the Sisters of Saint Anne regularly receives your prayer intentions, which are placed at the foot of Blessed Marie Anne Blondin’s tomb. Everyone who comes to the tomb prays for your intentions. Please send us your prayer requests by clicking on the link.